Elegantly designed bedrooms with queen bed, featuring most intricate pan-African decor. All rooms have private bathrooms with bath tub and a shower. Rooms have large double glazed window panels overlooking the Nairobi skyline and lush hotel gardens. All rooms are air-conditioned with WIFI internet connection. 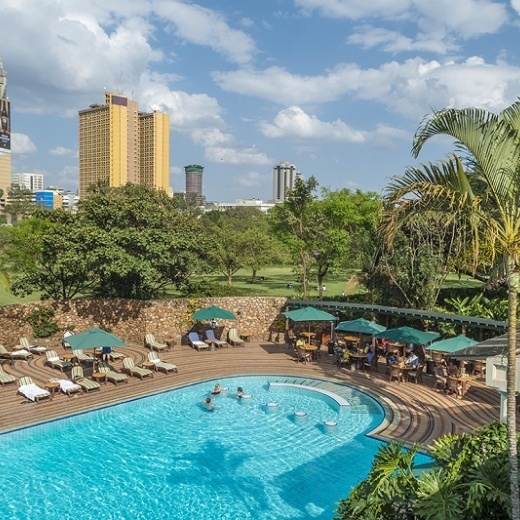 The Nairobi Serena Hotel is a quiet sanctuary in a flower-filled garden amid the bustle of one of Africa’s most dynamic cities. A member of “Leading Hotels of the World” the hotel is a haven located just moments from most of the cities attractions including art & cultural, institutions, shopping, nightlife and entertainment.